I love this photo. Haystacks are a thing of the past. How wonderful it was to see fields of neatly stacked hay. 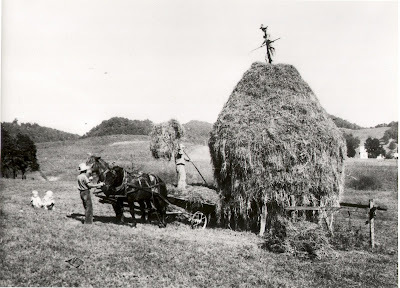 There is a definite skill in knowing how to properly stack hay. Now the square bails are being replaced by the round bales. A field of round, plastic wrapped hay rolls can not compare with a field of haystacks! This photo is courtesy of Hunter Armentrout. The last photo is the Stump Hotel in Sand Fork, WV. The auto is a 1902 Harvester Motor Wagon made in Gilmer County. 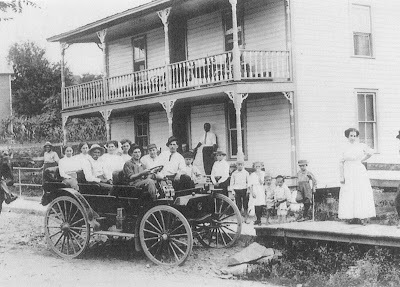 I came across many photos that reflected moments in past Gilmer County history, but did not directly relate to transportation. 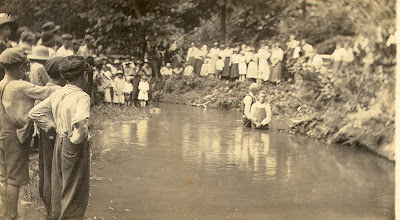 I love these two photos of a river baptism that were part of Troy Cottrell's family's heritiage. No sprinkling at this service- a full body immersion was evident in these photos. Bob Weaver, who publishes the Hur Herald, asked me to jot down some of my experiences when I was a high school student and worked at WSPZ in Spencer. Bob is trying to collect stories on the early days of broadcasting. Here are my memories. In 1963, when I was 17, the Spencer High School counselor, Ray Harris, hooked me up with a job lead. He told me the folks at the local radio station, WSPZ, needed to hire a high school student for part time work Two other high school students, Denzil Yoak and Scott Ward, were student disc jockeys, but they were leaving for college in the fall. Scott had a top 40 show at 5:00 P.M.- “The Scott Ward Show.’ The next day, I went to WSPZ for an interview. WSPZ was owned by Gordon Minns, who also owned the Coke Cola bottling company in Spencer. Bill Brannon was in charge of radio advertising. The main disc jockey was Tom T. Hall. At that time, Tom was singing and writing country music, but who knew that he would become a successful Grand Ole Opry member, storyteller, singer, and songwriter? The other full time disc jockey, who was also the radio transmitter engineer, was Charlie Ray. Charlie was like Mel Tillis – when he spoke, he talked with a severe stutter. As soon as the microphone was turned on, the stuttering stopped and his announcer voice was strong and natural. Before I was hired, Tom T. Hall interviewed me. He gave me a list of words that I should practice at home. In my second interview, I was hired after just a few minutes of recitation. Tom left for Nashville soon after I was hired. Glen Durst replaced Tom T. Hall at WSPZ. Charlie Ray instructed me on the operation of the broadcast console which consisted of the Collins control board and turntables. A turntable was located to the left and one to the right of the operator. These were, of course, adjustable for 33 1/3 through 78 rpm records. All commercials were recorded on large plastic tape cassettes and were stored in a shelving unit to the right of the turntables. When I sat at the console, the door to enter the control room was to the left. Straight ahead was a glass window that opened into a broadcast studio that was used for live performances and to record programs that were to be aired at a later date. To the right was also a window where the broadcaster could see the transmitter. At this time, WSPZ was transmitting with a power of 1000 watts. I remember that in the evening, the FCC required that we decrease the power to 250 watts. I would go into the transmitter room and throw the switch that decreased the power. Large vacuum tubes supplied the transmitter’s power. Even though fans cooled the machinery, the room was still warm. To the right of the transmitter was the Associated Press teletype machine, which supplied not only breaking news, but also current weather. We would remove the latest headline information for broadcast at the top of each hour. The record collection was located in shelves on the walls opposite the console. Each week in the mail we received current top 40 hits on 45 rpm records. There was also a large collection of 33 rpm records in the collection that had a very diverse genre. I recently gave a presentation for an academic banquet for the local public school students. As we were talking, I mentioned 45 rpm records. I realized that they were puzzled. I asked, “How many of you folks know what a 45 or 33 1/3 rpm record is?” No hands went up. The next question was “how many know MP3 and ipods?” All hands quickly went toward the heavens! Am I getting old? After DJ Scott Ward left for college, his top 40 radio program became “The Jim Meads Show.” (Go figure!) No one had much imagination those days in naming radio shows. I recall clearly the new songs that I played. : “Rhythm of the Rain”(Cascades), “Sugar Shack (Jimmy Gilmer and The Fireballs), “Surfin’ USA” (Beach Boys), “Tie Me Kangaroo Down, Sport” (Roll Harris), and “He’s So Fine” (Chiffons). There were also those crazy songs such as “Hello Muddah, Hello Fadduh!” (Allan Sherman) and I vividly remember that Peter, Paul, and Mary had hits in 1963 such as “Puff, The Magic Dragon” and “Blowing In The Wind”. In my broadcasting career, I witnessed a music history event during the 1963 Christmas season. How would I know that the Beatle’s releases “I Want To Hold Your Hand” and “I saw Her Standing There” were the beginning of Beatlemania. Later, I was one of the 73 million viewers who watched the Beatles on “The Ed Sullivan Show” on February 9, 1964. Top 40 was not the station’s only venue. I have fond memories of Lester and Linda McCumbers and The Sandy Valley Boys from Calhoun County. Their Saturday morning music programs were transmitted live from the broadcast studio. Their old-time music being transmitted out of the control room was a little strange to my young ears. What nice folks! I love to tease Linda about her performance when she would place her guitar on her very large belly and sing without any effort her rendition of “Ruby”. During those broadcasts, Linda was very pregnant with the next to the last of their nine kids. The band’s broadcast was sponsored by local businesses. One week Bill Brannon said that the local sponsors were no longer providing support to broadcast the McCumber’s Saturday show. Gordon Minns, president and owner of WSPZ, said “They don’t need a sponsor!” and he left them on the air. In addition to live performances, the studio was the site for recording religious programs during the week. Those presentations were recorded on a very large reel to reel tape machine located to the left on the console. The religious shows were then broadcast Sunday mornings. The shift on Sunday evening was slow for announcers. Easy listening was the music broadcast during this evening and most advertisers did not purchase the evening time slots. When we turned the wattage back to 250 watts, the number of recorded advertisements diminished quickly even on weekday nights. I recall that on one Sunday evening, my eye caught an obscure album entitled “German Beer Hall Songs”. I thought, “Why not educate the hamlet of Spencer with a little culture?” From around 8 o’clock until we signed off, I played those songs – all in German. Not a person called to complain. I guess the two folks listening (remember 250 watts is not a powerful signal) turned their dials to WWVA. As I reminisce, it is strange that events at the time seem to not be of great importance. I can remember Martin Luther King, Jr.’s speech on the steps of the Lincoln Memorial. I heard his “I Have A Dream” speech, but did not realize that it would live throughout history. In my 34 years of teaching experience, I realize that, throughout one’s life, many stories and experiences mold one’s persona. WSPZ is certainly an important part of my life’s special memories. We arrived safely, started a fire, and played a couple games of ten penny rummy. Our friends call it that "horrid little game." Friday was a beautiful day. We went to Marlinton. Dan wanted to share with us a gourmet restaurant know as French's. This is a quaint restaurant that serves excellent home cooked meals. Debbie, the cook, fixed our breakfast and it was great. The service was exceptional! I would recommend to anyone that they should experience the meals at French's! 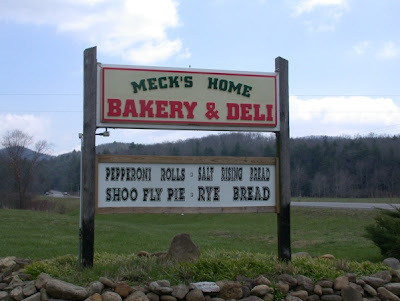 After filling our tummies with home fries, sausage, eggs, oatmeal, and toast, we drove to Meck's Bakery located between Green Bank and Cass. This is another wonderful place to visit. 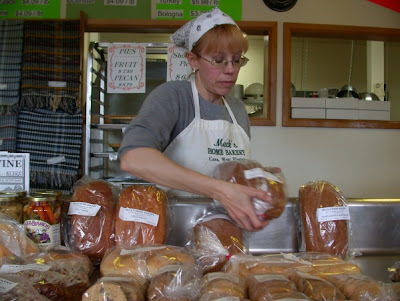 The reason for traveling here was to purchase their salt raising bread. We bought 10 loaves. 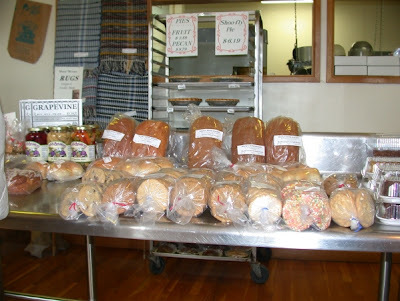 We came home with other goodies including cookies, cream horns, and zucchini bread. The zucchini bread was a surprise when Dan discovered it in his bag when he arrived back at the cottage. Guess the lady at the bakery decided that Dan needed it. Judy and I took a nap when we returned to Seebert. 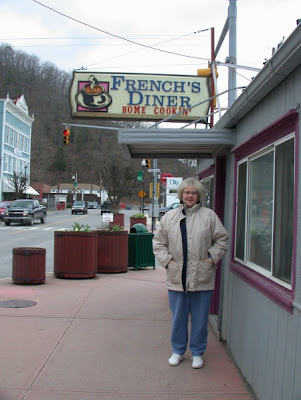 Judy was still sleeping when Dan, Pix, and I went to the Greenbrier. It is always a beautiful river. This photo was taken on Friday afternoon. 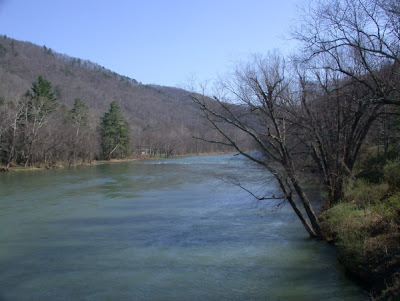 The Greenbrier River certainly changed its demeanor on Saturday and Sunday. On Friday night, the rains arrived. Saturday was a day of napping and card playing. (Quality eating is always on tap!) We had planned to go to Lewisburg where the folks there were having a chocolate festival. It was raining so hard that the Lewisburg trip was nixed. We did venture out to Hillsboro and shopped at Mrs. Dillard's craft shop. Packing up early yesterday and cleaning the cottage with Pix's new purchase, we were ready to leave our relaxing abode. By the way, Pix's new purchase is the Swivel Sweeper (AS SEEN ON TV!). It worked so well that we shipped our order last evening. 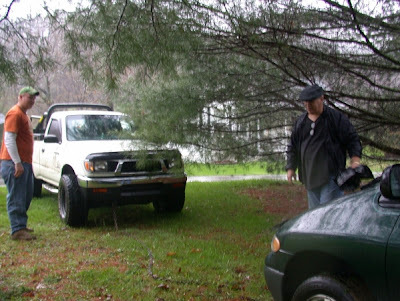 We had pulled the van just off the road toward the porch to facilitate loading our things. Guess what? 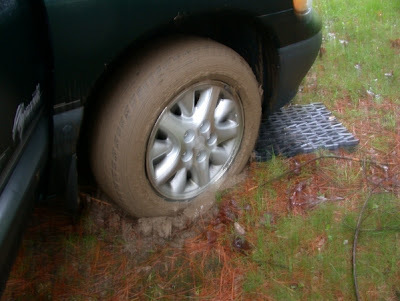 The rain has soaked the yard and we were immediately stuck. The front wheel drive started to dig into the yard. Dan and Pix tried several methods to untrap us in this newly formed bog. Finally Dan went to a neighbors. With his truck and a logging chain, we were easily extracted from our demise. 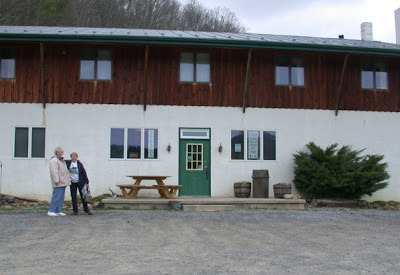 During our travel home, it was essential that we once again eat at the Ranch House in Craigsville. Flooding in the area would not allow us to travel our usual route through Muddlety. 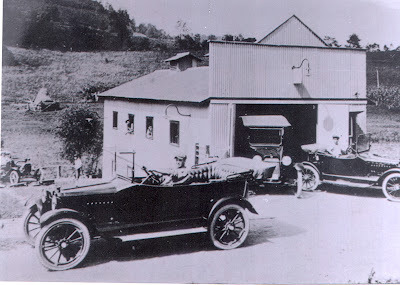 We headed toward Summersville and, after driving through a small amount of water on the road, we arrived in Burnsville safely. Once again a great trip with good friends. This morning the 1915 Calhoun County Rules of Conduct for Female Teachers were reposted. Thought I would share them with you. You've come a long way Baby! The world of rules is a subject of discontent for students and teachers in school systems, particularly in recent years when it seems the number of rules are never-ending. Calhoun educator, the late Fae Cox, submitted these Rules of Conduct for female teachers used in 1915, five years before women were given the right to vote. Female teachers must have had a tightening device to keep within the boundaries of these expectations, but maybe they were use to it back then. 1. You will not marry during the term of your contract. 2. You will not keep company with men. 3. You must be home between the hours of 8 p.m. and 6 a.m.
4. You may not loiter downtown in ice cream stores. 5. You may not travel beyond the city limits unless you have permission of the chairman of the board. 6. You may not ride in a carriage or automobile with any man unless he is your father or brother. 7. You may not smoke cigarettes. 8. You may not dress in bright colors. 9. You may under no circumstances dye your hair. 10. You must at least wear two petticoats. 11. Your dresses must not be any shorter than two inches above the ankle. 12. To keep the school room clean and neat, you must sweep the floor at least once a week with hot, soapy water, clean the blackboards at least once a day, and start the fire at 7 a.m. so the room will be warm by 8 a.m.
1. Demonstrate a belief that all students can learn. 2. Give assignments that make learning relevant. 3. Teach responsible citizenship and life skills. 4. Treat each student fairly. 5. Promote a safe and positive learning environment. 6. Be a good adult role model. 7. Exhibit a caring, honest and professional attitude. 8. Maintain professional growth and development. 10. Recognize the community as a partner in educating students. 12. Abide by policies and regulations. Well, the first of the week was beautiful with high temperatures into the 80's. Now for the next few days we are having lows in the 20's and SNOW! On Sunday, we had an outing to Job's Temple. Begun in 1860 and completed after the Civil War, this hand-hewn log church building is the oldest in the county. Built with local poplar trees and clay chinking, the church is 9.5 miles from Glenville. The reason that we went on this mini-adventure was to take current pictures for the WV Folk Festival newspaper. It is a fine old church with an interesting cemetary on the side. The sanctuary is in need of cleaning. During the fall and winter, the ladybugs have committed mass suicide on the floor. It will be cleaned. 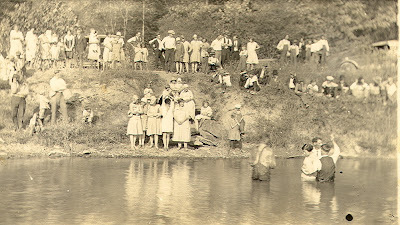 The Folk Festival ends with a service at Job's Temple on Sunday, June 24, 2007. All the West Virginia belles will be in attendance. 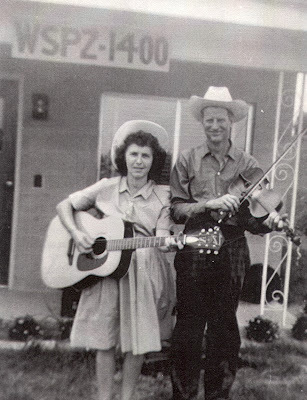 On Monday, Judy and I had the honor of visiting old time musicians Linda and Lester McCumbers in Nicut, Calhoun County. We went to their home to inform them that the 2007 West Virginia State Folk Festival is dedicating this year's festival to them. Lester is a Vandalia Award winner - the state's highest heritage award. He has won the over 50 fiddle contest for many years (including 2006) at the WV State Folk Festival. Both Lester and Linda are 85 years old and have been married since they were 16. They are among the last of the old-time musicians. I have know them since 1963 when they appeared every Saturday morning on the radio station WSPZ in Spencer. I was a disc jockey at that time and enjoyed working with the musicians during Saturday's performance. Linda's rendition of the song "Ruby" was a remarkable sound to behold. Lester has made around seven handmade fiddles which he displays on the bed in the guest room. He uses local woods including spruce and sassafras. What a great visit! We can not wait until June to see Lester in action on his fiddle! 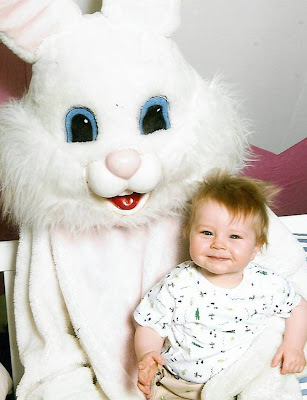 SAM and THE EASTER BUNNY! Top of the morning to you all. It is April Fool's Day. I am getting a little old for thinking of unique tricks. Tricks that do not demean, scare, or are extremely dumb seem to be a scarcity. Guess I will enjoy this wonderful spring day and forget about April Fool's games. It is another Sam sharing time. 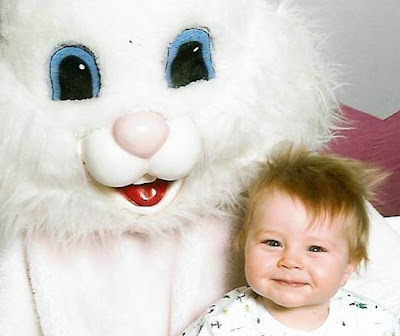 As you see, he seems so proud to sit in the lap of the furry Easter bunny. I still remember those exciting and special holidays as a kid.